A new high is recorded when a security's price reaches its highest level in 52 weeks. Similarly, a new low occurs when the price records a 52-week low. From this high and low data, StockCharts also calculates Net New Highs, which is new highs minus new lows, and the High-Low Ratio, which is new highs divided by new lows. The high-low data is available for several exchanges and from different sources. This article details these sources and explains the methods used in the calculations, which can result in different values for the similar indicators. First, the StockCharts data feed includes high-low indicators based on data from Dow Jones & Co, publisher of The Wall Street Journal. Indicators from this data source will have the words “Dow Jones” in the name and these are updated at the end of each day (EOD). The next three high-low data groups are sourced from StockCharts, but with different methods. First, StockCharts calculates and publishes its own high-low indicators for several key exchanges, including the AMEX, Nasdaq, NYSE, TSE and TSX Venture. Second, StockCharts provides high-low lists on the Predefined Scans page, where the totals are shown for each exchange. Third, users can generate their own high-low lists through the Advanced Scan Workbench. The next sections will expand on the different methods. Dow Jones indicators are based on high-low data from the AMEX, Nasdaq and NYSE. Even though these indicators are based on the same criteria (52 weeks), differences arise because of data adjustments and the symbol universe. For example, Dow Jones excludes ETFs from their symbol universe and their indicator totals will often be significantly lower than those from StockCharts, which includes ETFs. Chartists looking to chart indicators based on new highs and news lows should consider using the Dow Jones high-low data. The table below shows a sample of the high-low indicators based on Dow Jones data. 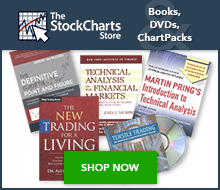 StockCharts calculates indicators based on new highs and new lows for the major stock exchanges. This means we maintain component lists of all securities traded on these exchanges. The indicators are calculated and published to our website throughout the day, with the final calculation taking place about an hour after the close of trading. The table below shows a symbol catalog sample for these high-low indicators. Data from StockCharts may differ from other sources due to component changes and data adjustments. With over 10,000 securities in our symbol universe, exchange listings change and require updates on a regular basis. Also note that StockCharts uses dividend-adjusted data for its calculations, while other sources, such as Dow Jones, use non-adjusted data. The chart below shows a comparison of NYSE high-low indicators based on StockCharts calculations and Dow Jones data. Notice that the Dow Jones values are consistently lower than the StockCharts values because Dow Jones does not include ETFs in its calculations. The new highs and new lows lists on the Predefined Scans page are updated throughout the day, with the final update occurring around an hour after the close. In addition to the normal screening criteria, these results are also filtered by volume to remove thinly-traded securities. A security must average at least 40,000 shares of daily volume over the past 20 days to qualify for this screen. This requirement reduces the security universe and may account for differences between the indicator total and the total shown on the Predefined Scan table. User-defined scans can also be used to generate lists for new highs and new lows. Just to recap, the Dow Jones data comes from our data feed, while the StockCharts indicators and Predefined Scans page are finalized around an hour after the close. Further data adjustments sometimes occur overnight and these adjustments can result in small discrepancies. Results from a user-defined scan will include the most recent data adjustments and represent the most current list. This means totals from a user-defined scan might not exactly match the indicator value or the totals shown for the Predefined Scans. The example below shows 139 new highs on the NYSE for August 25, 2017. This number matches the predefined result because the scan required the 20-day average volume to exceed 40,000 shares. Removing this requirement would result in more stocks making the scan. The chart example below shows the NYSE high-low indicators based on Dow Jones data. First, the main window shows the cumulative Net New Highs Line, which is based on NYSE New Highs-New Lows - Dow Jones ($NYHLDJ). The green histogram shows NYSE New Highs - Dow Jones ($NYHGHDJ) and the red histogram shows NYSE New Lows - Dow Jones ($NYLOWDJ). For reference, Net New Highs ($NYHLDJ) is shown in the lower indicator window. Notice how this indicator fluctuates above/below the zero line as new highs exceed new lows and then new lows exceed new highs. Click here for a live version of this chart. Click here for a current list and to see the starting dates for these symbols. The example below shows a sample list of symbols. Note that the starting dates are shown in the symbol catalog under the “first data point” column. Users can search for breadth indicators by quantifying their search criteria using the advanced search functions. Searching for “new -percent -zealand -houses -housing -newgrowth -usmf” is enough to highlight the high-low indicators, which all start with a Dollar sign ($) and appear at the top. The word “new” is the key search term. The terms preceded by a minus sign (-) are excluded to narrow the search and remove unwanted names.